If you spend any time on the watch forums, someone will post "I just got into watches and I want to buy my first automatic. What is the best one for under $200?" Inevitably, that person will get dozens of responses, and almost everyone will say either "Seiko" or "Orient" (a few will say "buy two Vostok Amphibias! ", but that is another review). 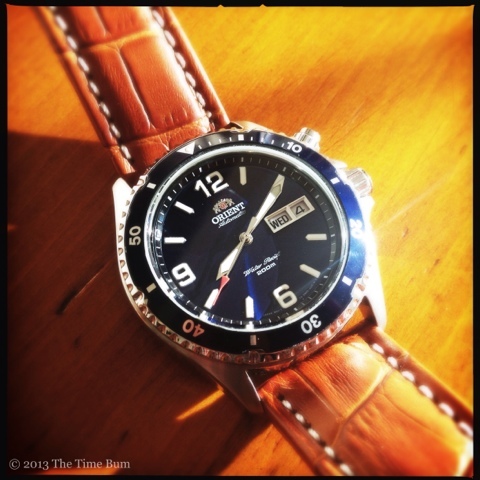 Now, everyone has heard of Seiko, even people who don't care about watches, but an Orient? What is that? The Orient Watch Company was founded in Japan in 1950. They make both quartz and mechanical watches, and unlike the majority of watch manufacturers, they use their own domestically produced, in-house movements. The Seiko Epson Corporation purchased a controlling interest in Orient in 2001, and it became a wholly owned subsidiary in 2009, but although they share the same parent company (Seiko Group) they are not part of Seiko Watch Company, and there are no Seiko movements in an Orient watch. The Blue Mako featured here (model FEM65005DW) is one of the most beloved and recommended Orients in the watch community. It is a simple three-hand with day and date complications. It features a 41mm case with polished sides and a brushed surface, and a flat mineral crystal. It is a shirt sleeve friendly 13mm thick. The large primary crown is decorated with the Orient rampant lions crest and protected by graceful crown guards that minimize its size. 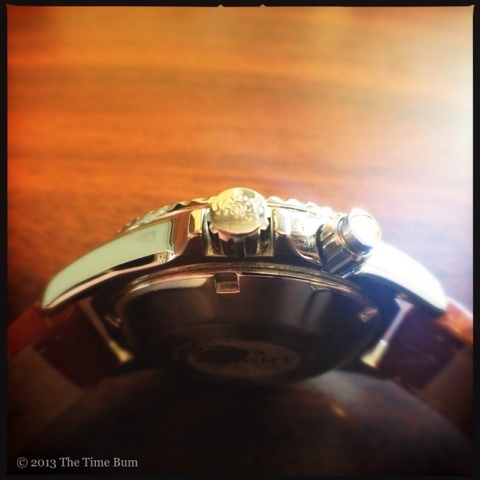 A secondary crown sits at 2:00 and is used for setting the day. Both crowns are screw down, and the watch has a greatly useful water resistance of 200m. The screw-in case back also features the Orient crest, although I wish it was offered with see-through case back so we could better appreciate the 21 jewel automatic movement within. The signature feature of the Mako is its vibrant sunburst dial, which displays the rich, deep blue color to great effect. The matching blue bezel is polished, coin edged, and unidirectional with numerals in increments of 10 and hash marks only between top center and 10. Large Arabic numerals sit at 12, 6, and 9. White day and date windows occupy the 3:00 position. Sword shaped hour and minute hands make the rounds long with a red-tipped second hand, sweeping with characteristic smoothness of an automatic movement. All hands and markers feature polished edges. A polished Orient crest with red center is applied below 12 with the Orient name below and "Automatic" in tiny italic script below. This typeface is also used for "Water Resist" near 6:00 with 200m below. This is a fair bit of writing on the dial but it is tastefully restrained and properly proportioned, so it looks detailed, instead of cluttered. While slightly reminiscent of an Omega Seamaster Planet Ocean, the large numerals and sword hands lend it more of a pilot look, giving the watch a personality all its own. I find the blue to be magnificent, but if you would like something else, Orient sells black and orange dialed Makos, and its companion model, the Ray, has a more traditional diver dots for markers. Not everything is perfect, mind you. The hands, markers, and bezel pip are all illuminated, but only in theory. In practice they produce an anemic glow that fades quickly. This is one area where I wish they would borrow from Seiko. The Mako is sold in steel bracelet and rubber strap variants. The one reviewed here came on the standard rubber strap decorated with dolphins. Yes, dolphins. It did an admirable job protecting the spring bars until it could be replaced, and that is best I can say about it. Fortunately, the slightly curved lugs are long enough to provide ample clearance for a variety 22mm straps. Here is where it gets fun. Because it is a legitimate 200m diver, you can easily toss a NATO on it and head for the water, but the polished details and case sides, the gentle curve of the case, and the shimmering blue lend the watch a certain elegance that begs for a tailored leather strap. The aviation elements in the design work well with a pilot strap or a Breitling style padded leather with contrasting stitching, like the light brown SecTime strap in the photos. This is the real beauty of the Mako - it can be whatever you like. 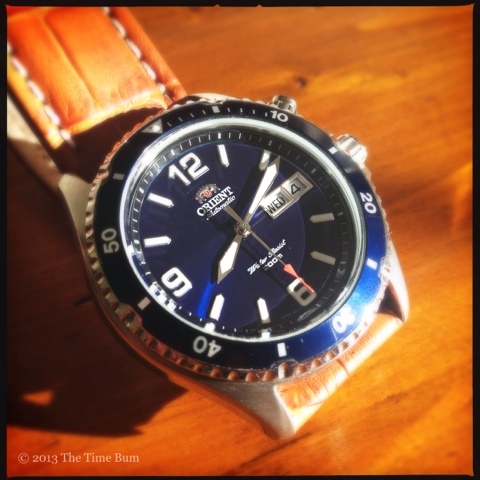 The Mako sells on the Orient USA website for $245, but Orient runs an almost perpetual 30% off sale. Online retailers such as Long Island Watch and Creation Watches frequently sell Makos and Rays between $115-160, sometimes a little cheaper. At full retail, this would still be an impressive watch, but at $100 less it is one of the great bargains of the watch world. Use your savings to buy some interesting straps and enjoy. 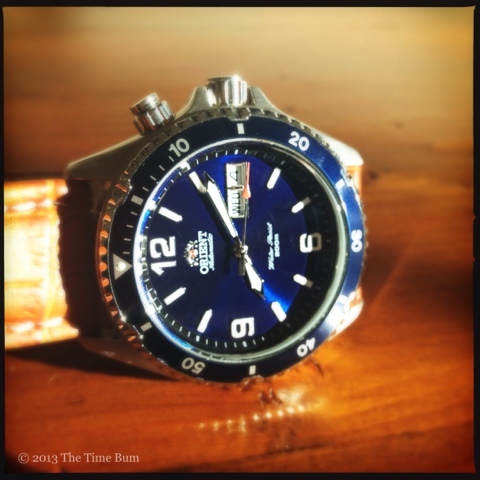 The Mako is inexpensive, but rubber strap aside, it does not look cheap. 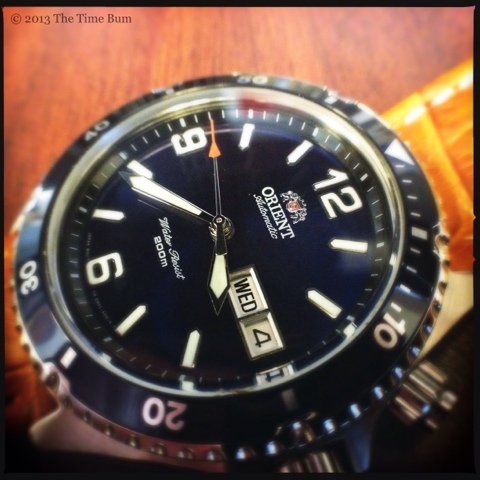 Prepare to get noticed, and prepare to answer the question, "An Orient? What is that?" Sum: Strong, pretty, and has a good heart. Everything you want for a long term relationship.